Normally when we go on a trip somewhere, we end up with 6-10 really good photos worth sharing, which give an overall impression of the experience. 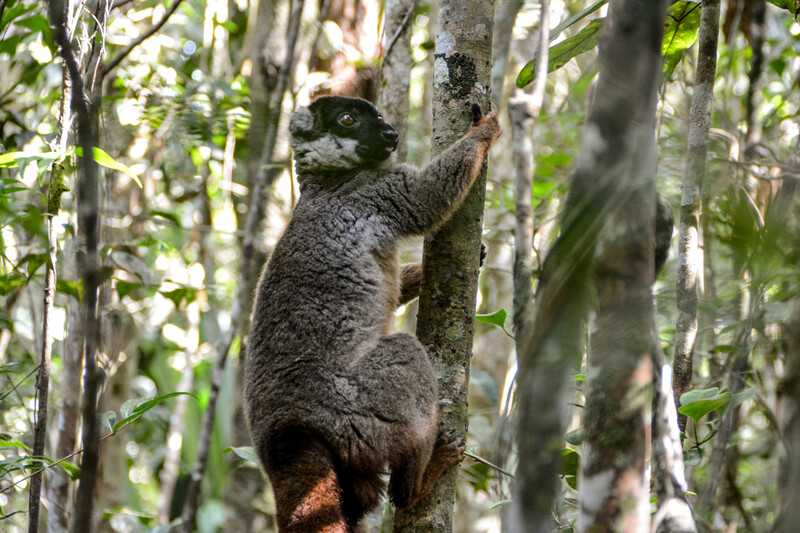 But I have been stalling on this post because the number of close-up lemur photos we got is pretty overwhelming. So I’m just going to post a bunch of them below and let you discover these odd and endearing animals yourself. 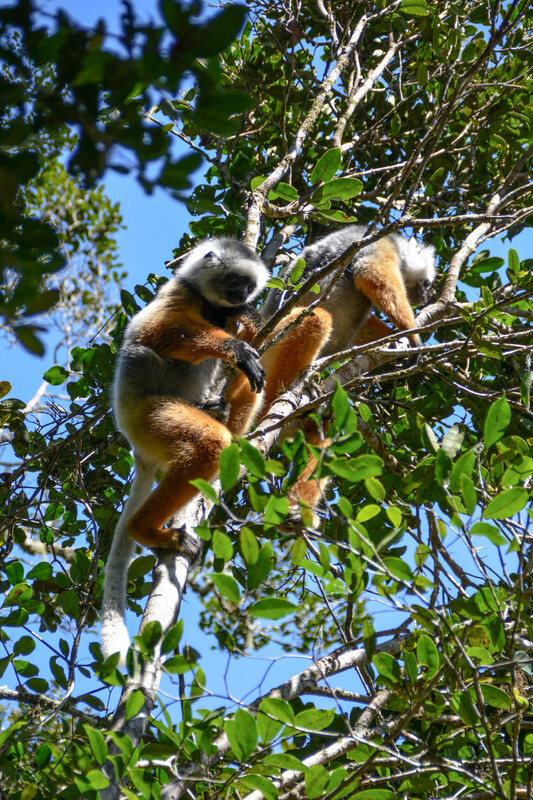 But first, by way of explanation – Andasibe-Mantadia National Park is east of the capital Antananarivo – about halfway to the coast – and a common destination for tourists visiting Madagascar. We’ve been there before, but like most people, we limited ourselves to the much more accessible Analamazaotra Special Reserve. This time, we decided to hire a driver and guide and “rough it” down the 90-minute stretch of rutted dirt road that took us to Mantadia National Park. We hiked up and down steep jungle trails for nearly 4 hours, and yet barely made a dent in the park. To give an idea, the map above shows a satellite track of our hike. Well, I forgot to turn it off as we drove southward out of the park. The actual track we hiked is completely hidden under the top dark green circle. But enough about all of that. We got amazingly close to the lemurs, which not only seemed completely unafraid of humans, but many of them have this comical habit of staring off into the distance like they are intently focused on something else. Enjoy. 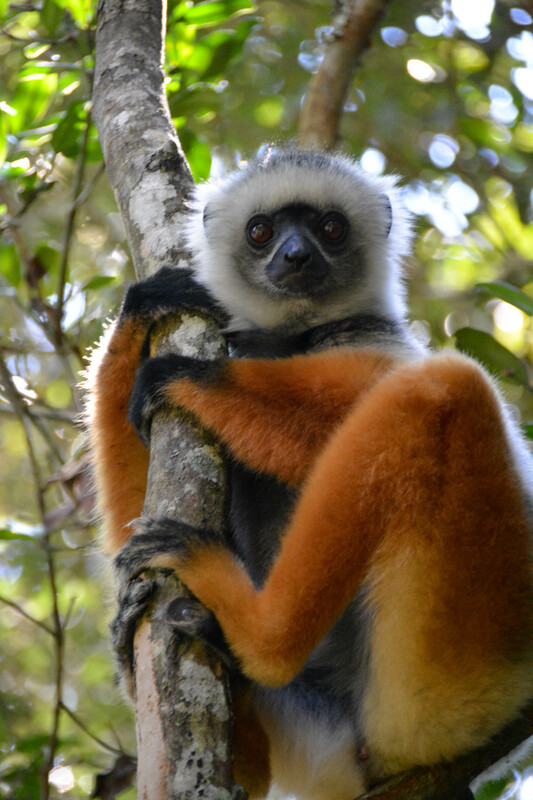 This first guy is a diademed sifaka, and yes, he appears to be wearing a radio collar. 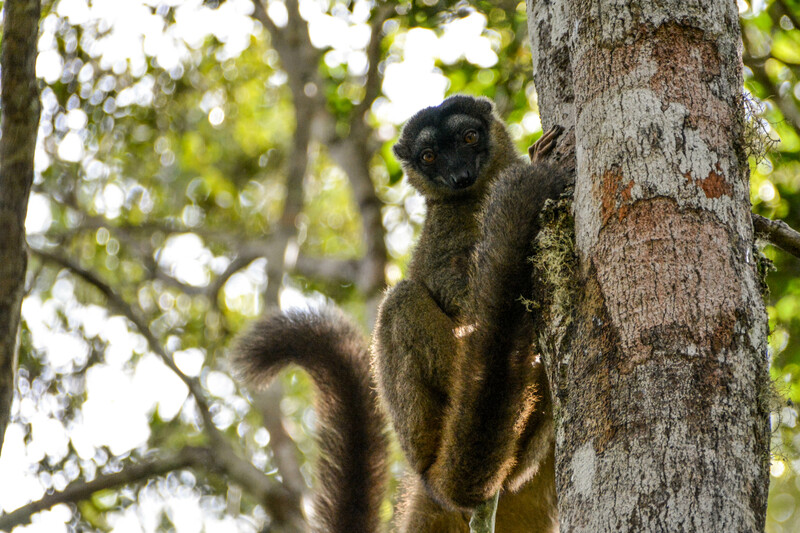 The lemurs above are pretty common, relatively speaking, among Madagascar’s 110 or so species – known as the brown lemur. 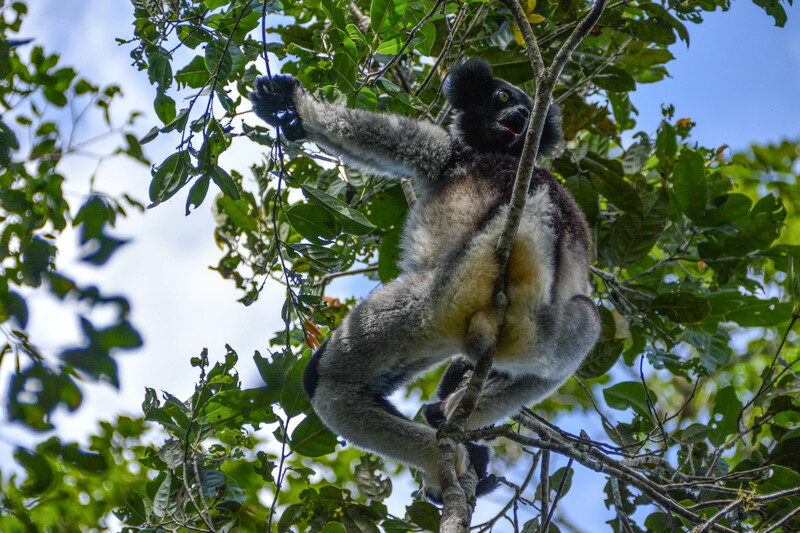 They hopped from tree to tree, grunting, and collected near a high crook between two limbs where there was water. As they drank, water would occasionally drip down on us below. 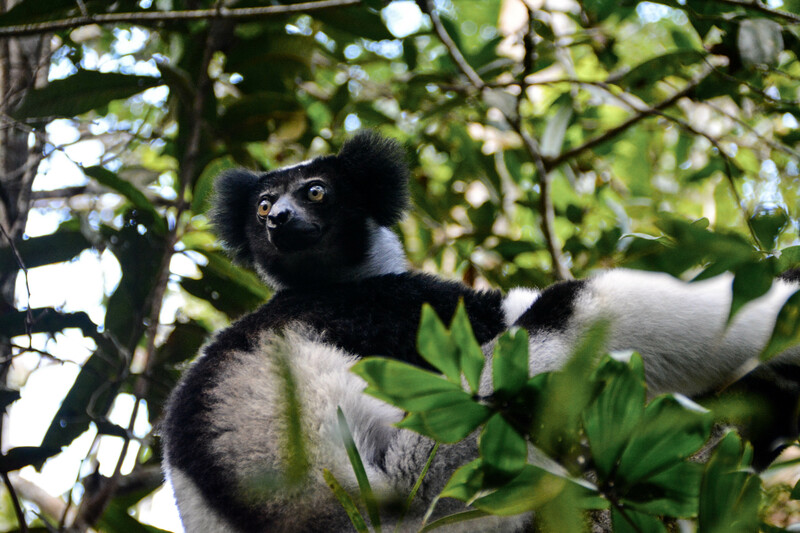 The black and white Indri is the largest lemur species. 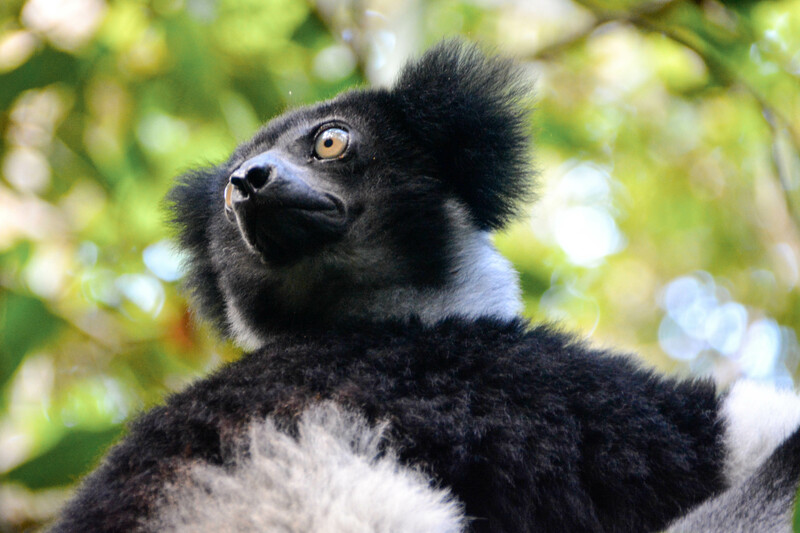 The indri is known for its haunting call, which I recorded the last time we visited Madagascar – you can hear it here. 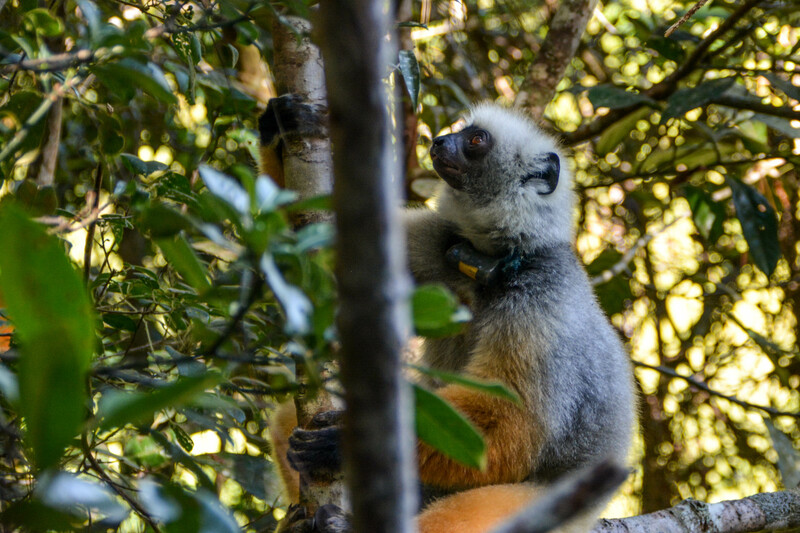 Typically one of them will keep a lookout while the rest of the group – anywhere from 4 t0 8 – will feed on leaves. 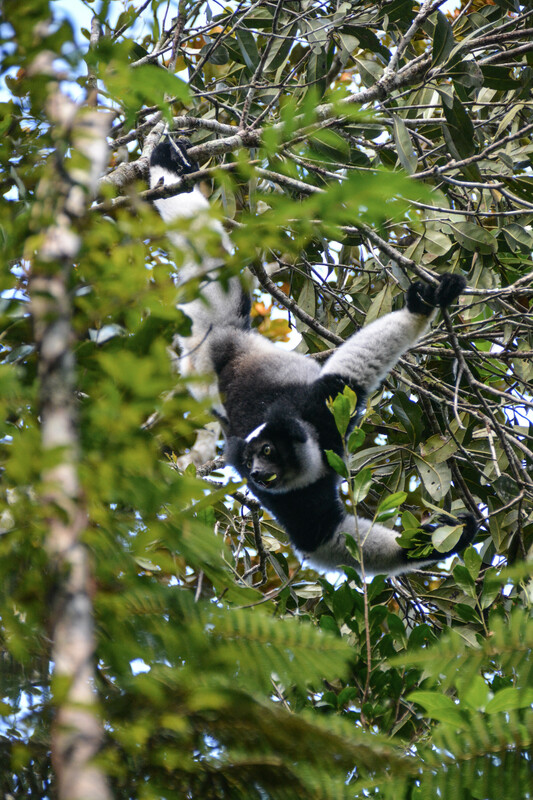 They are black and white, but appear to have a yellow stripe on their lower backs from sitting on branches. They will also hang from their hind legs. As you can see in the photo below, they will let you get quite close. 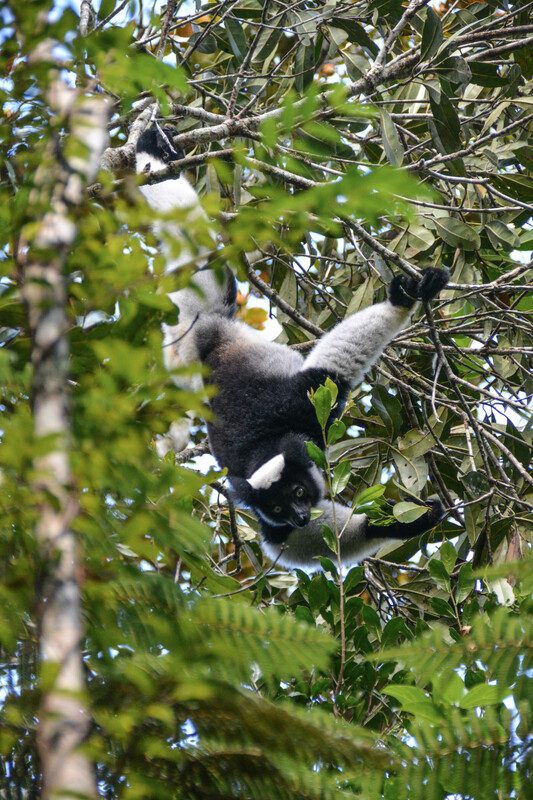 Sadly, lemurs are occasionally taken as bush meat by people who lack access to other protein sources, and even prized as a delicacy by those who can afford to pay for it. This article explains more. 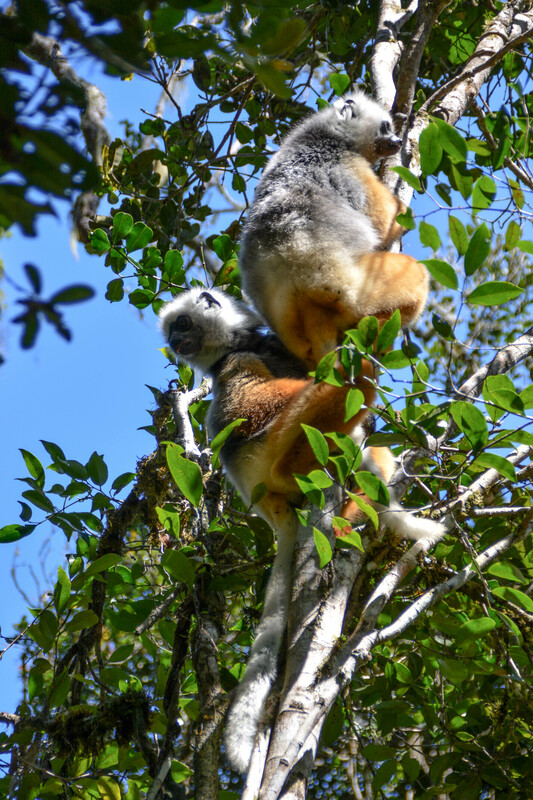 This group of sifakas was jumping from tree to tree – easily clearing 5 meters in a jump. 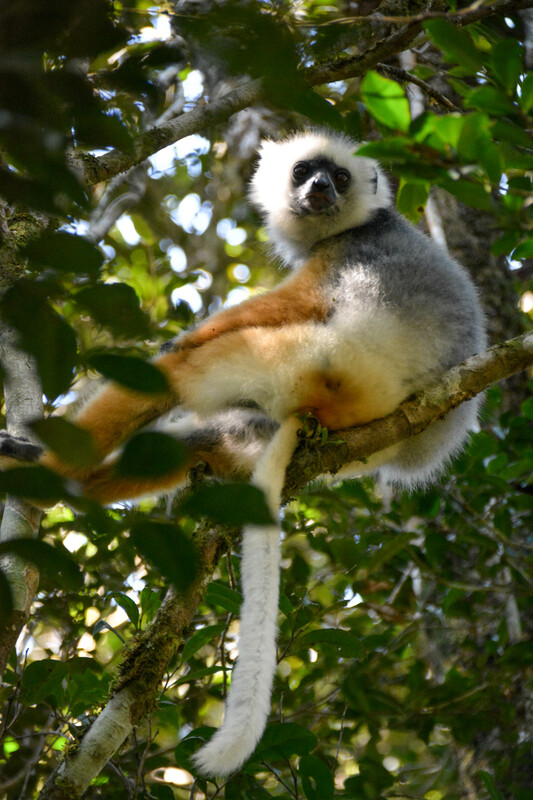 The dominant female is in charge of the group in all lemur species, and she determines where they eat. 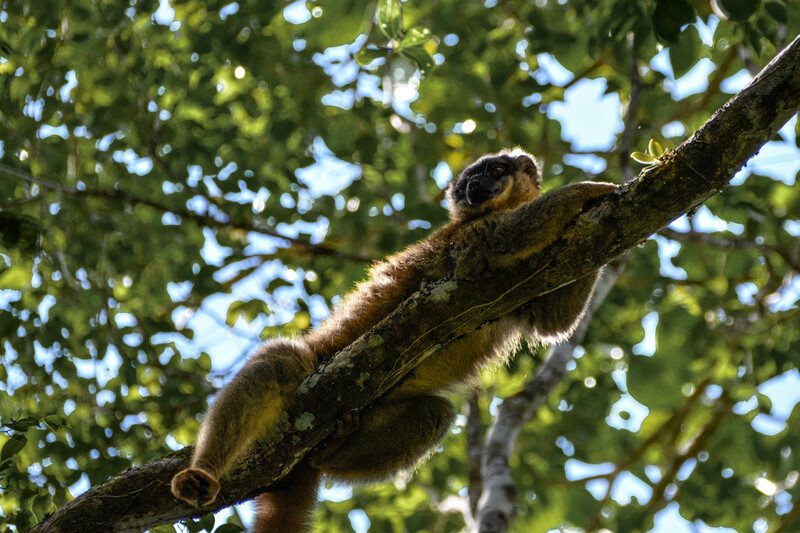 In the photo below, the lower lemur jumped to this tree and first had to pay his respect to the dominant female above, by licking/cleaning her fur before he could go and eat. 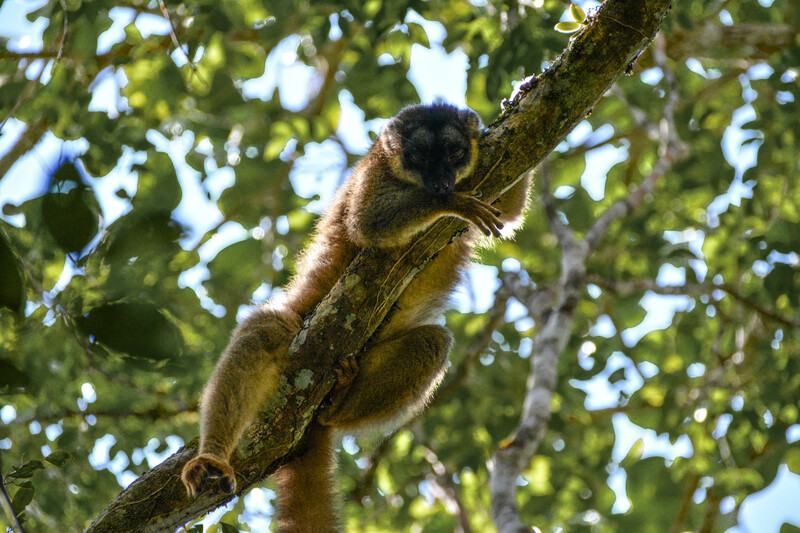 Scientists are still discovering new species of lemurs – usually small nocturnal ones, but not always. 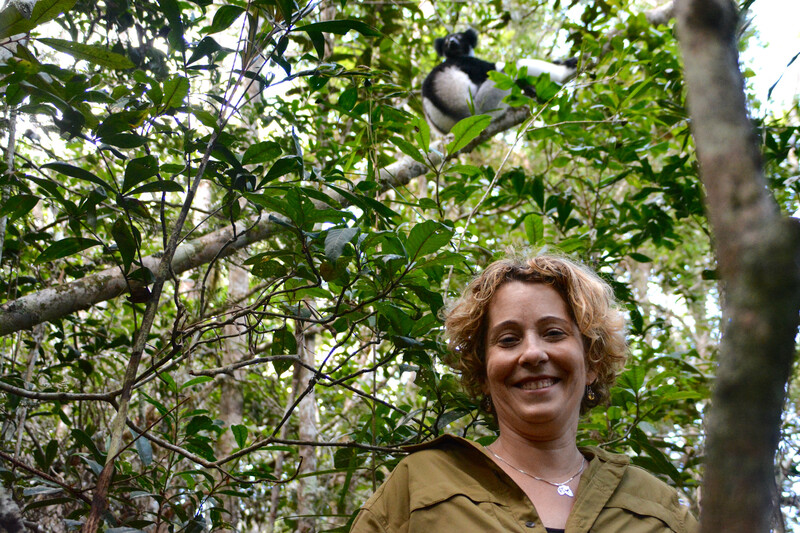 They are up to about 110 species. 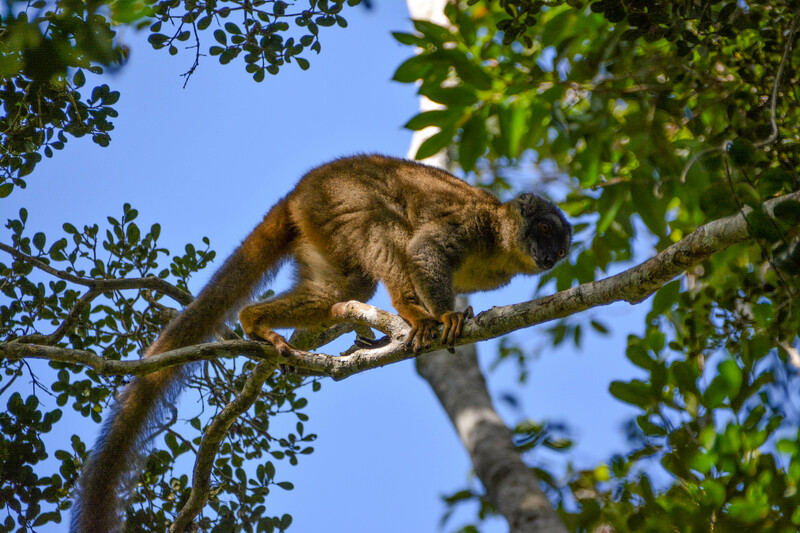 Sadly, their habitats are very specific to each species, and all of them are quickly disappearing as deforestation is not only holding steady, but increasing. Protected areas have been established, but the government does not have sufficient resources to protect them. 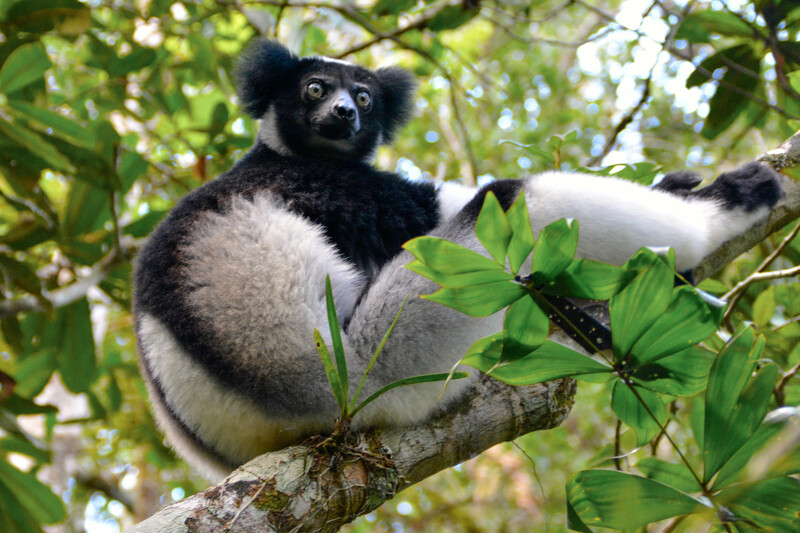 Some experts predict that in the next 15 to 25 years, all of Madagascar’s primary forests could be gone. 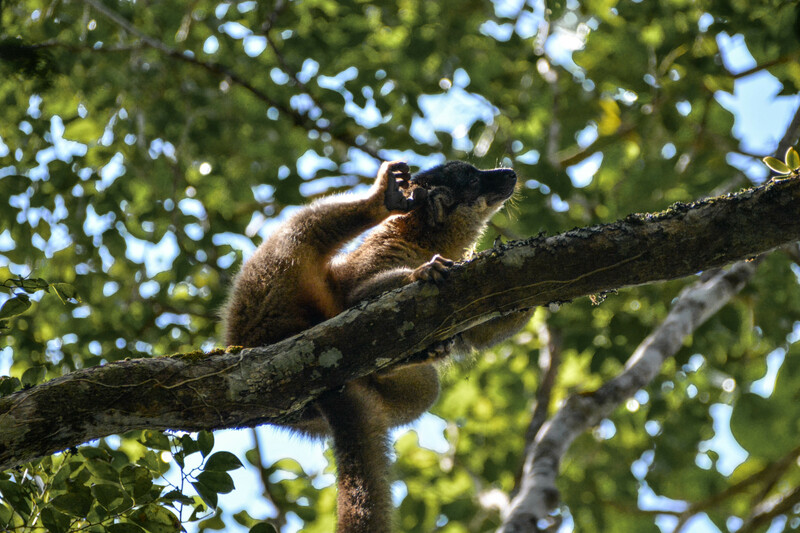 This means up to 90% of lemurs will face extinction in the same time frame, because most have thus far been unable to live in captivity. 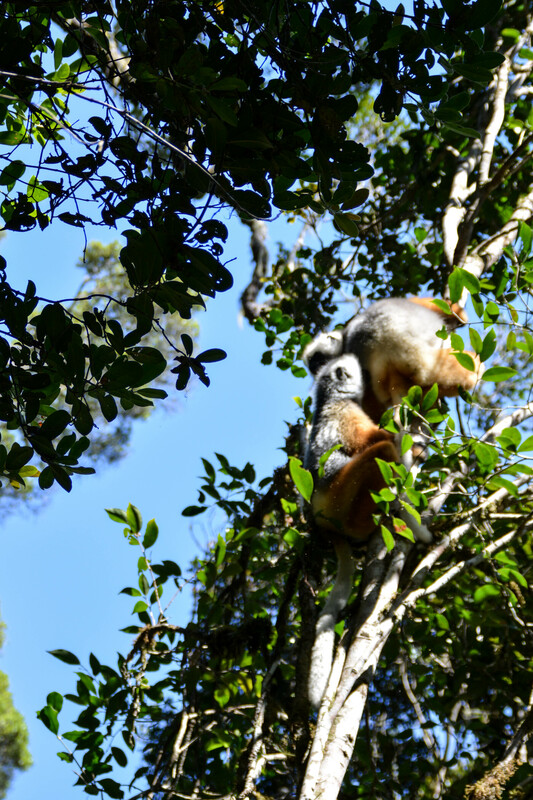 We feel extremely fortunate to have been able to see them, and are hopeful that people will find a way to keep these little primates around. 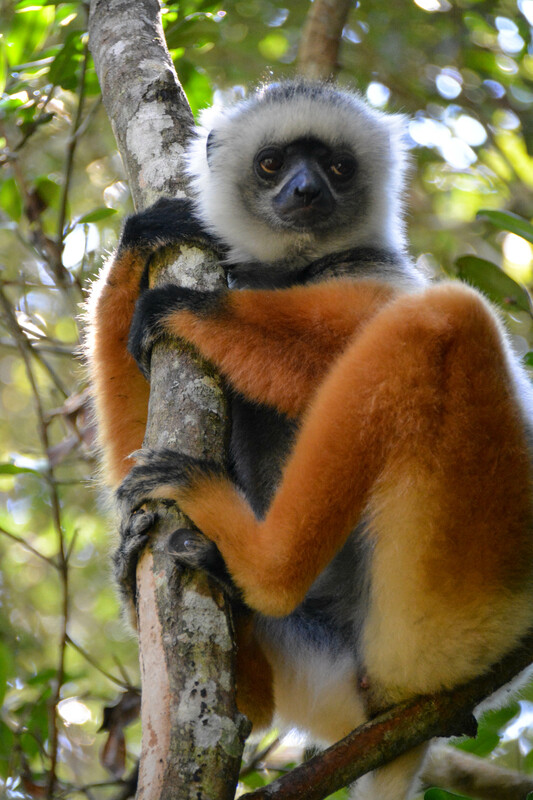 This entry was posted in Madagascar, Wildlife and Nature and tagged indri, lemur, Madagascar, Mantadia, primate, sifaka. Bookmark the permalink.